“What are these?” Harry asked Ron, holding up a pack of Chocolate Frogs. “They’re not really frogs, are they?” He was starting to feel that nothing would surprise him. I’ll be the first to admit that I’m a sucker for cute packaging. I love buying into the hype and excitement of themes, like Harry Potter. So it was no surprise that I had to curb my enthusiasm at The Making of Harry Potter in London. I did however, buy one of the Chocolate Frogs. At the end of the day though, it was just a huge lump of chocolate in the shape of a frog. It may have had its head nibbled at, but it was packed away with the thought, ‘I’ll eat more later’. And so it travelled through Croatia (a nibble here), Greece and Paris (a nibble there), but was eventually thrown out. So when I sat down to make Harry Potter’s Honeydukes Chocolate Frogs from the Honeydukes Express, I wanted to rethink how they were made. In the movie, you see the frog jump and move like a real frog (most likely due to the ‘croakoa’). While I couldn’t make them move, I did want them to feel more frog like. I remembered making the ‘Gi-normous Gummy Bears‘ a few years ago, and wondered if there was such a thing as Chocolate Jello (there is). Better yet I found a homemade recipe for Chocolate Jello from Serious Eats and mushed it with my gummy bear recipe. Visually, I only had one type of frog mold, and it didn’t have as much real detail as I had hoped. I came across this highly detailed chocolate frog mold on Amazon though. 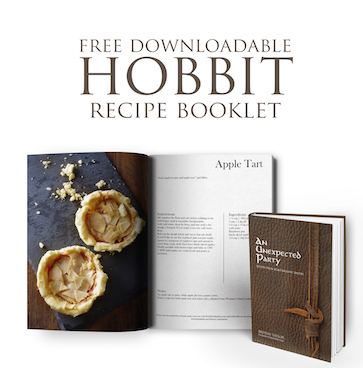 I’ve got one ordered so will show you when I make a second batch! As an after thought, I’d highly recommend placing something like pretzel pieces into the middle, so when eaten, it crunches. I thought this after reading that JK Rowling was possibly inspired by Monty Python’s Crunchy Frogs. “Mr. Hilton: Oh, we use only the finest baby frogs, dew-picked and flown from Iraq, cleansed in the finest quality spring water, lightly killed, and sealed in a succulent, Swiss, quintuple-smooth, treble-milk chocolate envelope, and lovingly frosted with glucose. Inspector: Well, don’t you even take the bones out? Monty Python can be seen here on youtube. 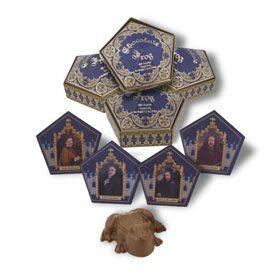 Want the chocolate frog packaging to go with it? I scanned and cleaned up the packaging from The Wizarding World of Harry Potter, which you can find here. In a bowl, mix together the 75ml of milk and gelatine powder. Set aside. Stir until all mixed together, then let sit over the medium heat until it starts to bubble around the edges. When it starts to bubble, turn off the heat, pour in the vanilla essence, place (carefully!) the gelatine, and stir until dissolved. 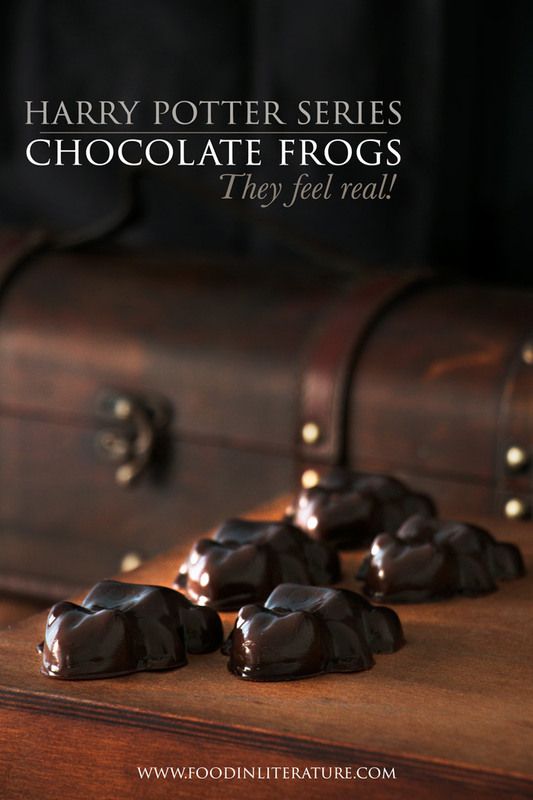 Let sit for a few minutes so it's not overly hot, then carefully pour into your frog molds. Place in the fridge for 20-30 minutes to firm up, then remove from molds. We are planning to make your chocolate frogs recipe for a small family party next weekend, but don’t have access to powdered gelatine here, only leaf gelatine. Can you recommend a substitution? According to Google, 1 (0.25 oz.) envelope granulated gelatin = 1 tablespoon powdered gelatin = 3 sheets leaf gelatin. Hope that helps! Where did you find the mounds? I’m in the u.k and can’t find them any where??? Where did you buy your groot plant? 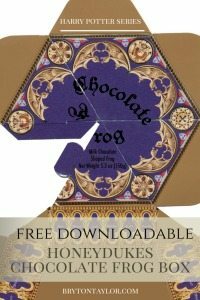 I love this take on the chocolate frog! I haven’t had chocolate gummies before, so I’m really intrigued. Why are you whispering throughout the video? I was mucking around with my microphone and messed up the audio for a few of the videos. It happens! Can you make these in advance and freeze them before an event? And if so how long would you freeze them for? Hi Chantal, I wouldn’t try freezing them. If making in advance I’d say 48 hours would be fine. I’m making this right now….but I’m a little confused. In the video you say 20 ml cocoa, but 200 is written….and I’m messing around with all sorts of converting websites since I’m an American living in Europe with boxes in metric and utensils in US style….but looking at your Pyrex the cocoa looks about at the 75 line….which looks like the exact quantity I have in my box of cocoa and would be great. Could you please clarify for me? Thanks! Sorry, Kim, for the confusion! It would be 200ml. I made these for a friend’s Harry Potter-themed birthday party this last weekend, and they were SO GOOD! They tasted like chocolate pudding, and squished and stretched in a horribly satisfying way. 🙂 I will be making these again, definitely! Thank you so much for posting this recipe! I was wondering how many of the frogs can be made from the above recipe? Hi! Can you give the conversions of ML to cup, tbsp, etc? Hi Britney, Have sent you an email with the conversions.